The reason the 1991-92 NBA season was one of the most memorable seasons in NBA history is because the league was affected by one of the most tumultuous years in American history. The Source, which at the time was to the burgeoning counterculture of hip-hop what Rolling Stone had been to rock in its infancy, lived up to its mission as “the magazine of hip-hop music, culture and politics,” with its December ’92 issue. It featured NBA superstar Charles Barkley and filmmaker Spike Lee. “Both [men] recognized the importance of themselves, and each other,” said Chris Wilder, then-managing editor of the magazine. “I’m sure that they wanted to work with each other.” They also likely recognized the influence of the publication. At the time The Source, now in its 28th year of publishing, was hip-hop’s sacred text. Album reviews might as well have been chiseled into stone tablets instead of printed onto glossy paper. Landing the cover meant instant credibility. And this cover had begun to take shape in the zeitgeist over a year before. On Nov. 7, 1991, Earvin “Magic” Johnson shocked the world with the news that he’d contracted HIV and would retire immediately. Until Johnson’s announcement, HIV was widely viewed as a disease that only affected gay white men and was considered a sure death sentence. The Los Angeles Lakers Hall of Famer became the Crispus Attucks of America’s war on HIV and AIDS, inspiring fans to stand unified as AIDS became a killer in the black community. Landing the cover meant instant credibility. And this cover had begun to take shape in the zeitgeist over a year before. Charles Barkley, then 29 years old and in his eighth season with the Philadelphia 76ers, persuaded his team to unretire Billy Cunningham’s No. 32 jersey so he could wear it in honor of Magic Johnson. Barkley, who currently co-hosts TNT’s Inside The NBA and was recently tapped by that network to host a six-episode series called The Race Card, was as outspoken as he was talented, which made him a media favorite. And in 1992, the brash power forward — even coming off a string of All-NBA first team selections and three straight playoff appearances — was not happy. Not one to address issues indirectly, Lee opened Malcolm X with the grainy recording of the beating of Rodney King. The Sixers were in the middle of an abysmal season that ended in a losing record, and with Barkley demanding a trade. He went to the Phoenix Suns (for three players), and was also on the way to the XXV Summer Olympiad to play with one of the most storied teams of all time. Those infamous words, “ ’90s n——” — complete with the hard “e-r” in case the point was unclear — served as the headline for the cover story in The Source featuring Barkley and Lee. In December 1992, Lee was 35 and had just released Malcolm X, the most ambitious film of his career. In March ’91, more than a year before the movie opened, a citizen-recorded video surfaced of Los Angeles motorist Rodney King being beaten by Los Angeles Police Department officers. On April 29, 1992, a jury acquitted all four officers of assault with a deadly weapon in a beating in which King sustained among many other brutal injuries a fractured skull and damage to internal organs. This was the climate in which the director Lee filmed the epic Malcolm X. King — who was in an operating room for five hours — had alleged at trial that the cops had yelled, “We are going to kill you, n—–. Run!” as they beat him. He was found dead in his home swimming pool in 2012 at the age of 47. The acquittals ignited a powder keg of discontent in black and brown communities of Los Angeles: a week of civil disobedience, looting, and arson — the L.A. Riots — that resulted in 55 deaths, thousands of arrests, and over $1 billion in property damage. The NBA postponed two playoff games: the Portland Trailblazers at the Los Angeles Lakers and the Utah Jazz at the Los Angeles Clippers, eventually moving them to Las Vegas and to Anaheim, California, respectively. Not one to address issues indirectly, Lee opened the film with the grainy recording of the beating of King. Those infamous words, “ ‘90s n——,” served as the headline for the cover story in The Source. Obviously, this was a different Lee and Barkley from the duo singing Jimmy Buffett in commercials between NCAA tournament games. 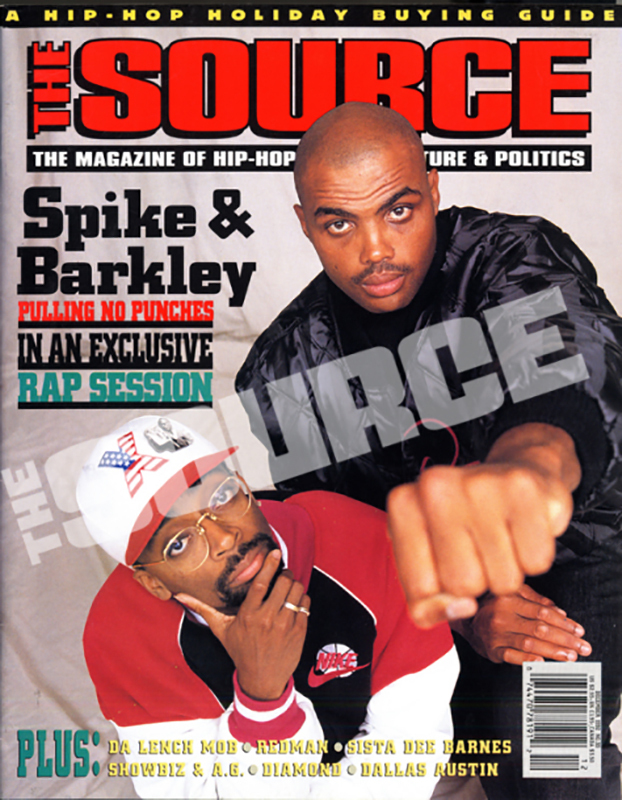 Having both Spike Lee and Charles Barkley on the same magazine cover seems natural now — but was a massive deal at the time. But, as they are now, both Lee and Charles were in high demand. The photo shoot was a big moment, and it required collaboration. According to the photographer Keith Major, present at the studio was himself, of course Barkley and Lee, The Source‘s then-director of photography Chi Modu (who is releasing a photography book about Tupac Shakur next month), Wilder, who wrote and conceived the story, and photo assistants Jac Benson II — who went on to become a producer of Yo! MTV Raps and many other influential shows — and Ron Archer. Modu shot the behind-the-scenes footage for the interior photography, but the cover image is Major’s. Two outsized personalities. Two masters of their respective crafts at the height of their powers. In the months after the issue hit newsstands, Lee was snubbed for a best director Academy Award nomination as his film received near unanimous critical acclaim. Denzel Washington, for his portrayal of Malcolm X, was nominated for an Academy Award for best actor. Roger Ebert called Malcolm X “one of the great screen biographies, celebrating the whole sweep of an American life.” Barkley was named the league’s MVP at the close of the 1992-1993 season. In 2006, he was inducted into the Naismith Memorial Basketball Hall of Fame. We perceive both men so differently now. But the experiences, successes and failures that come with age do not diminish both men’s impact on culture. Almost as important as the fact Barkley and Lee were at one point masters of their respective crafts is that both men refracted that mastery through the prism of unapologetic blackness. That blackness, in all of its splendor, was on full display on this cover of The Source. Spike’s iconic “X” hat and Barkley’s left hook to the establishment made the same statement the bruising power forward made to those reporters back in Philadelphia: We do what we want to do. Greg Whitt is a writer from Washington, DC. He likes salt, pepper, ketchup, and mumbo sauce on his fries. You can find his writing on Uproxx, and occasionally his laptop's recycle bin.